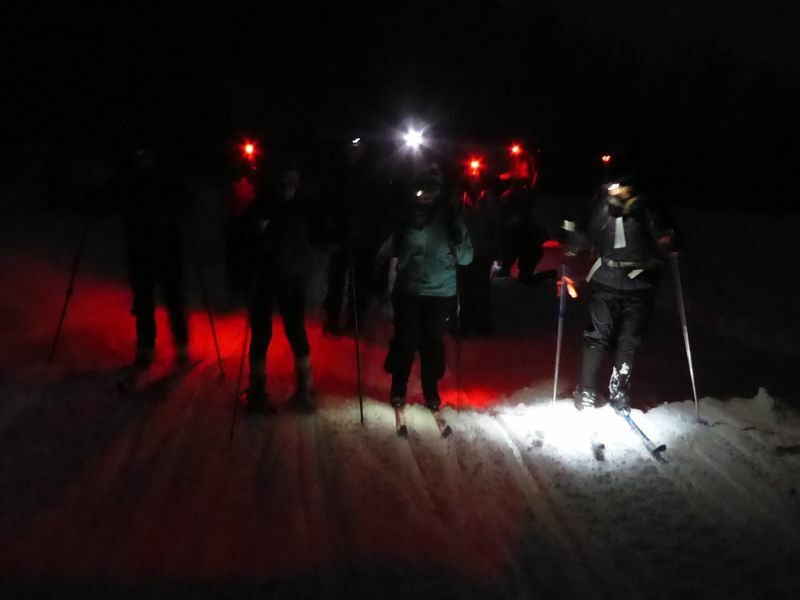 We planned this evening event to experience the pleasure of traveling through a snowy landscape by the light of the full moon. 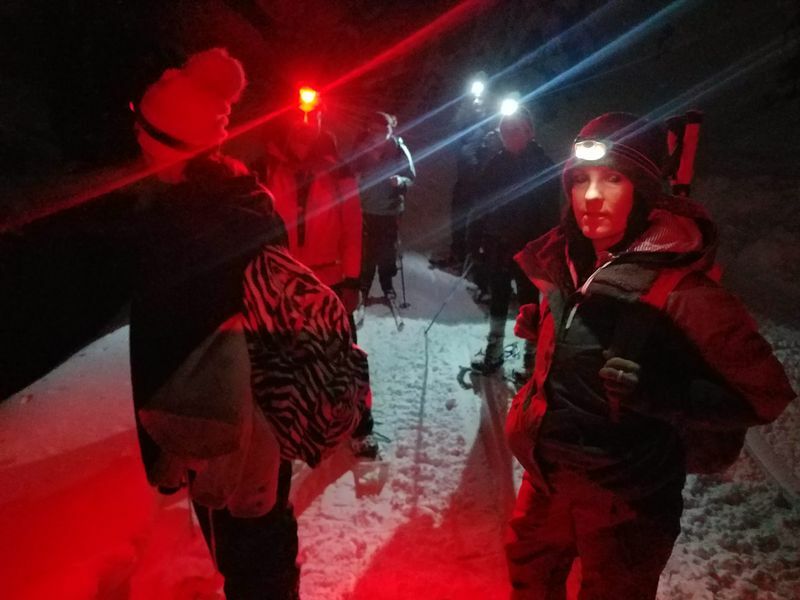 Sixteen Cache Hikers assembled at our Logan meeting place at 6:00 p.m. to arrange carpools before heading up Logan Canyon to the Franklin Basin Winter Trailhead. 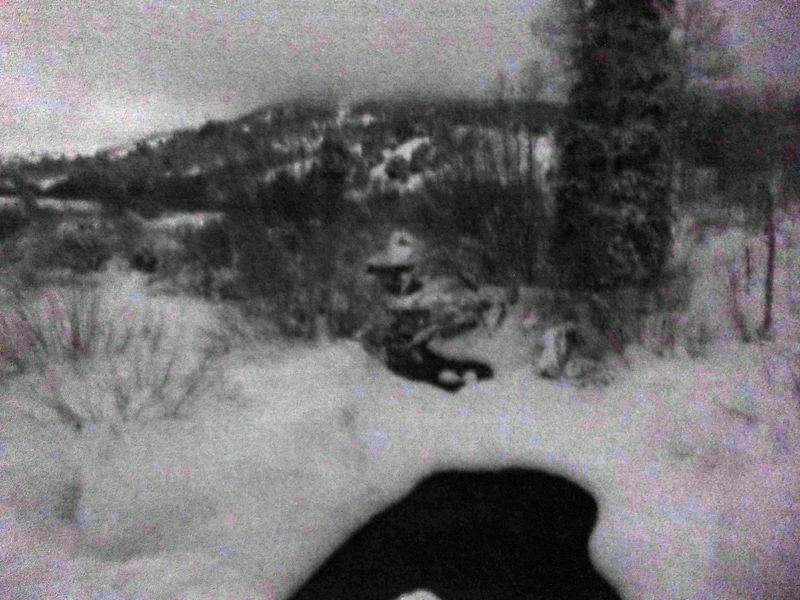 People were loading a couple of snowmobiles at the trailhead when we arrived, but they were gone by the time we all got geared up. 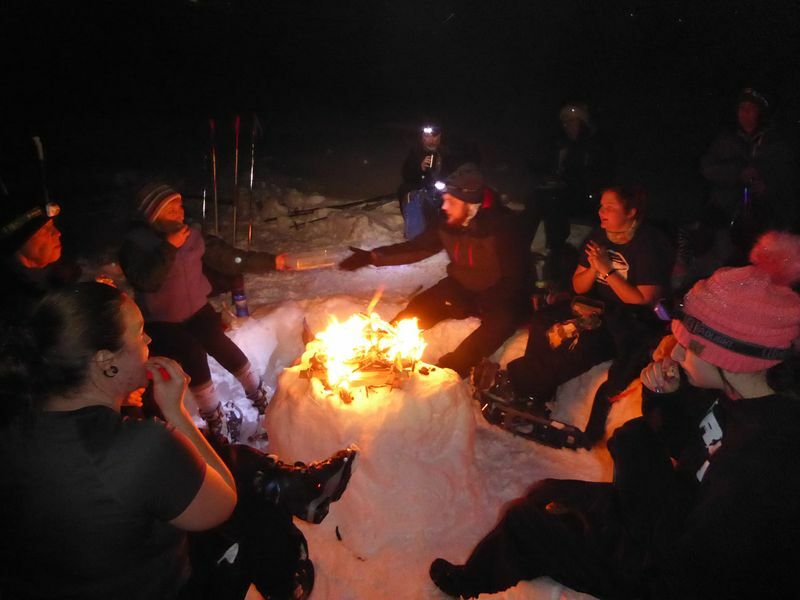 We started out on the trail at 7:10, with Dave W. (the leader), Teresa, Maggie, Brent and Jane on cross-country skis and Tawnya, Lexi, Christine, Lynne, Matthew, Patricia, Rachel, Monika, Caesar and Jesse on snowshoes and Thatcher rode in his father's child carrier. 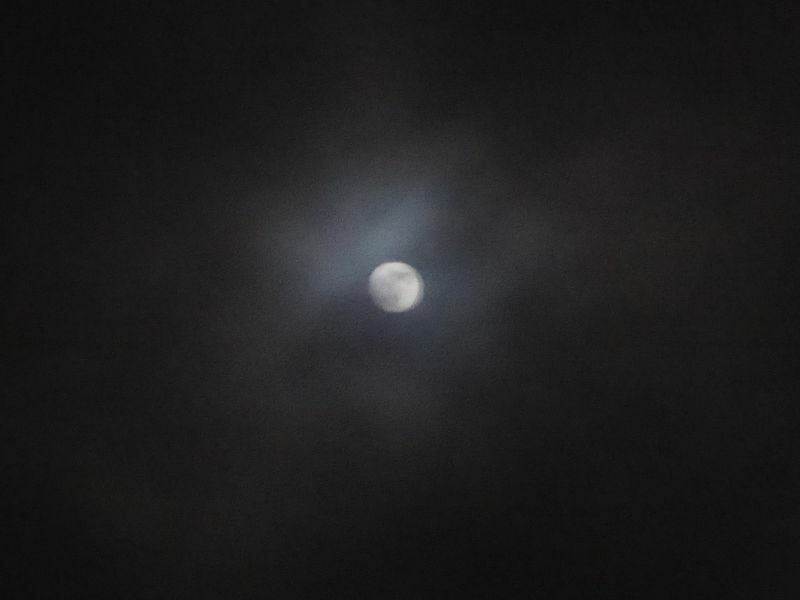 The moon was not visible due to the overcast sky, but enough light diffused through the clouds to allow us to see the terrain. 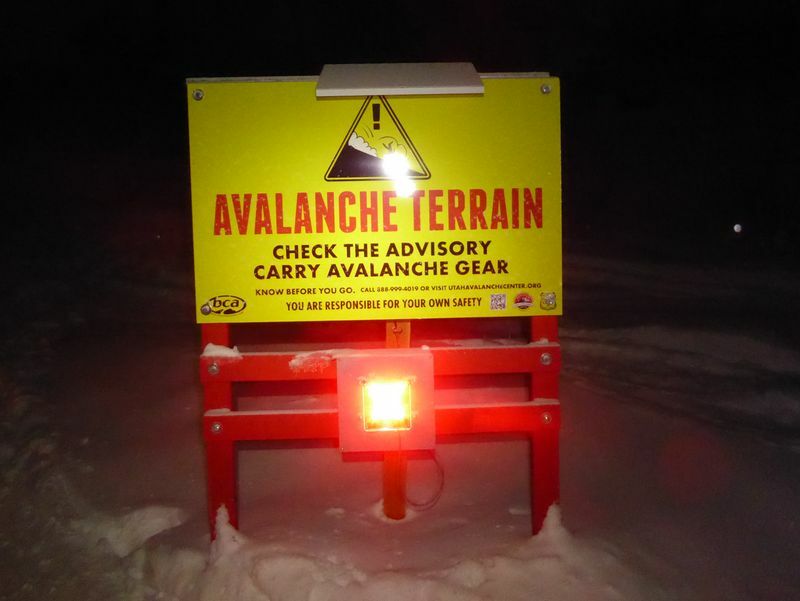 People used headlamps since there wasn't enough natural illumination to properly discern trail features, although several hikers used the red lights to help preserve their night vision. 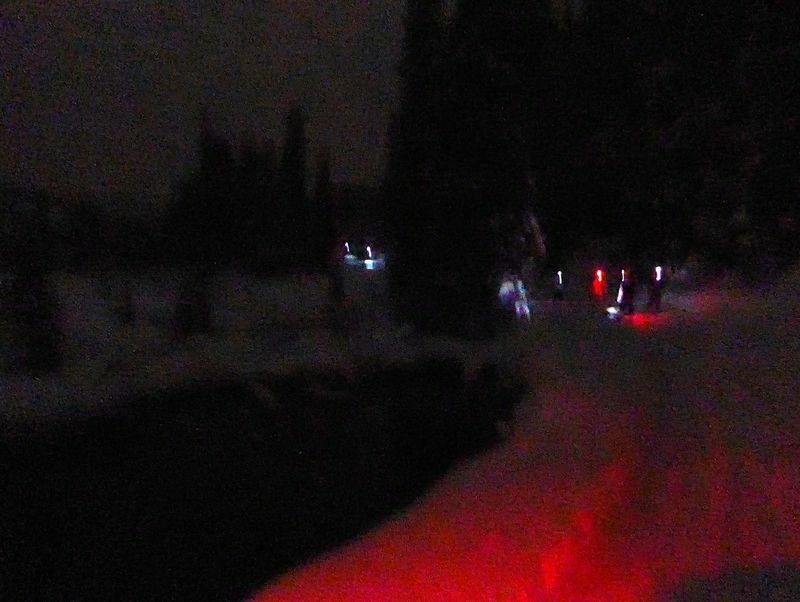 After 1/3 mile we turned off the groomed snowmobile trail (the Franklin Basin road) to enjoy the sights and sounds of running water as we followed the Logan River upstream. The previous day Jane and Dave had broken a track there, but some participants still were breaking though the soft and deep snow. A small group (Thatcher and company) chose to shorten the trip and went back early and a couple others decided to follow the packed road to avoid the soft snow - this was a day when larger-size snowshoes were a good choice. We rejoined the road after a mile of following the river. Soon the hooting of a great horned owl accompanied us as we approached Beaver Spring, the first owl we have heard on our night hikes since 2011. Shortly after Beaver Spring we turned back toward the river, arriving at our destination at the edge of a meadow near Hansen Hollow about 8:30. We all sat, some on a pre-constructed snow bench and others on the top rail of a nearby wood fence. Cookies were shared as we enjoyed pleasant weather, a warm fire and good company. About 9:40 we extinguished the fire, put our skis on and headed back on the packed trail, arriving at the trailhead about 45 minutes later. Nobody seemed to be in a hurry to put an end to this pleasant experience as we tarried another 15 minutes or so before starting back down US-89 toward Logan. Sixteen participants: Tawnya, Lexi, Dave W. (leader), Teresa, Christine, Jane, Brent, Lynne, Matthew, Patricia, Thatcher (small child), Maggie, Rachel, Monika, Caesar and Jesse. Started on the trail about 7:10, tarried around the fire 8:30 - 9:40, arrived at the trailhead about 10:25. Drove back to Logan about 10:40, arriving in Logan by 11:30 p.m.